+ US Amateurs Now 700,000 Strong! There are now more than 700,000 radio amateurs in the US, the highest number ever. This chart reflects Amateur Radio's growth since 1999. Note that as the number of total licensees grows, so do the number of Technician, General and Amateur Extra class licensees. Please note: While the number of licensees has grown considerably over the years, we realize that these numbers include some who are no longer active in Amateur Radio. A recent survey of ARRL members, however, indicates that more than 80 percent of those responding are active. *The number of new Technicians peaked in March 2011 at 342,572. Click here for larger image. As the third quarter of 2011 came to a close, ARRL VEC Manager Maria Somma, AB1FM, began calculating the number of licensed Amateur Radio operators in the US, as well as the number of new licensees. "At the end of September, I saw that the number of hams in the US was high," she said. "When I started comparing that number with other years, I found that it was an all-time high." For the first time, there are more than 700,000 radio amateurs in the US. 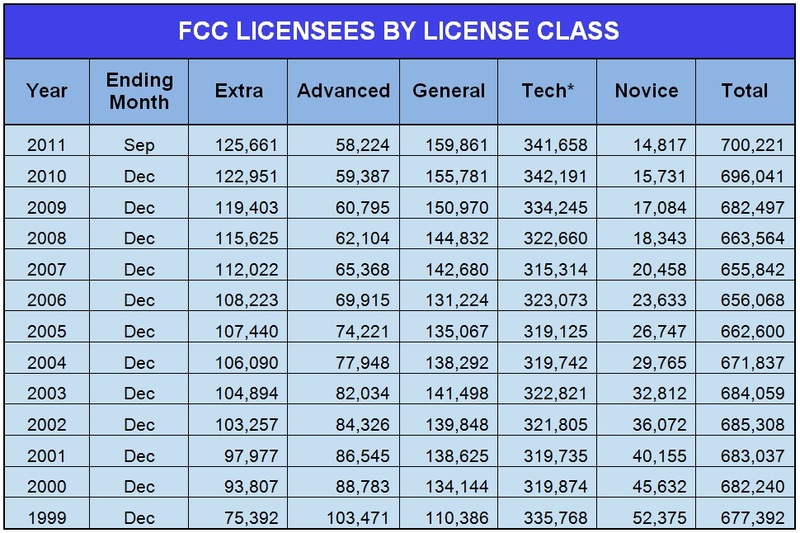 "When looking at the three current license classes -- Technician, General and Amateur Extra -- these numbers are impressive," Somma explained. "The number of Technicians peaked in March 2011 at 342,572, while in September 2011, we saw both Generals and Extras peak at 159,861 and 125,661, respectively. 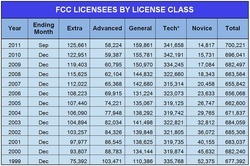 As new Technicians earn their Amateur Radio licenses, and current Technician licensees move on to General and Generals upgrade to Extra, this can cause up-and-down fluctuations for these totals." Read more here. 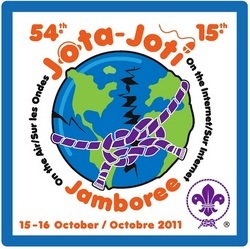 If you are planning on participating in this weekend's Jamboree On the Air (JOTA), take note: Astronaut Mike Fossum, KF5AQG, is planning to participate in JOTA from the International Space Station, using the call sign NA1SS. According to the AMSAT website, Fossum's schedule is somewhat flexible on the weekends, but he will not be available for every pass. The typical crew work periods are 0800-1930 UTC, but they are sometimes available a bit later. When available, Fossum will be operating on the standard ISS frequencies. In the US and elsewhere in IARU Regions 2 and 3, the uplink is 144.49 MHz. In Region 1, the uplink is 145.200 MHz. The worldwide downlink for NA1SS is 145.800 MHz. The Sixth Annual ARRL On-Line Auction will be open for preview at 10 AM (EDT) on Friday, October 14, and will open for bidding at 10 AM (EDT) on Wednesday, October 19. According to Advertising Manager and ARRL On-Line Auction Coordinator Deb Jahnke, K1DAJ, there is a large assortment of ARRL Product Review items, including a Yaesu FT-DX5000D HF and 6 meter transceiver, an Ameritron ALS-1300 HF power amplifier, a Ten-Tec 599AT Eagle HF and 6 meter transceiver, a Kenwood TS-590S HF and 6 meter transceiver and an Elecraft P3 panadapter, as well as a wide assortment of books, including ARRL Handbooks from the 1920s and 1930s. "If you are interested in some great bargains and some great fun, you really need to check this out," she said. Jahnke also encouraged visitors to visit the site to pre-register and scope out those "must-have" items. The 2011 ARRL On-Line Auction runs through 11:59 PM (EDT) October 26. ARISSat-1 -- the latest Amateur Radio satellite -- began its education-based mission after deployment from the International Space Station in August 2011. The ARISSat-1 mission is to provide a variety of information through its many broadcast modes promoting STEM-based education initiatives in the classroom. In an effort to help realize this mission, the ARRISSat-1 Team is sponsoring a CW contest. To participate, listeners need to copy and submit any six of the more than 200 call signs transmitted during ARISSat-1's multiple satellite passes. These call signs represent those radio amateurs who have made significant contributions to the ARISS program or Amateur Radio as a whole. They have been digitally stored on board ARISSat-1 and are being transmitted in rotation using Morse code at 145.92 MHz. The call signs can be heard between the RS01S CW identification and the CW telemetry in the repeated code transmission sequence. Read more here. The AMSAT 2011 AMSAT Space Symposium will be held November 4-6 in San Jose, California. This year's Symposium coincides with the celebration of the 50th anniversary of OSCAR 1, the first Amateur Radio satellite. The Symposium will feature presentations on amateur satellites, operating techniques, news and plans from the amateur satellite world, as well as an AMSAT General Meeting and a meeting of AMSAT's Board of Directors. While the final schedule is still being worked out, AMSAT has announced that Lance Ginner, K6GSJ, will be the speaker at the banquet. Ginner helped build and develop OSCAR 1 and OSCAR 2. His involvement with Amateur Radio spacecraft continued with OSCAR 3, OSCAR 4, OSCAR 5 (the first for the newly formed Radio Amateur Satellite Corporation in 1970), OSCAR 6, OSCAR 7 and OSCAR 8. ARRL Laboratory Test Engineer Bob Allison, WB1GCM, will also be speaking at the Symposium, accompanied by a prototype of OSCAR 1. With help from Ginner and other AMSAT members, Allison and W1AW Station Manager Joe Carcia, NJ1Q, refurbished the prototype, one of three made by Project OSCAR. One of the satellites went into orbit in 1961, one is on display at the Smithsonian Air and Space Museum in Washington, DC and the other, until recently, was sitting in a display case in the downstairs hallway at ARRL Headquarters. Read more here. Students from Ghana, Uganda and Trinidad and Tobago attended the United States Telecommunications Training Institute (USTTI) Amateur Radio Administration Course (ARAC) at ARRL Headquarters October 3-7. ARRL Chief Technology Officer Brennan Price, N4QX, coordinated the session and led the course. ARRL Assistant to the Chief Executive Officer and Meeting Planner Lisa Kustosik, KA1UFZ, coordinated ARRL's participation with USTTI. According to Price, the students work in their respective government telecommunications offices dealing with telecommunications and Amateur Radio testing, licensing and monitoring. Read more here. The George Hart Distinguished Service Award may be presented by the Board of Directors to the ARRL member whose service to the ARRL's Field Organization is of the most exemplary nature. The Distinguished Service Award is named in honor of George Hart, W1NJM, long-time Communications Manager at ARRL Headquarters and chief developer of the National Traffic System. Read more here. The Sun, as seen on Thursday, October 13, 2011 from NASA's SOHO Extreme Ultraviolet Imaging Telescope. This MDI (Michelson Doppler Imager) image was taken in the continuum near the Ni I 6768 Angstrom line. The most prominent features are the sunspots. This is very much how the Sun looks in the visible range of the spectrum. Tad "Let the Sun run down right behind the hill" Cook, K7RA, reports: Strong solar activity continues. Check here for daily images of the Sun, and you'll see it is full of spots. You can also use the archive feature to view the position of sunspots for previous days. The average daily sunspot number for the week (95.4) was about the same as last week (96.7) and the week before (96.1). The number hasn't stayed steady though, with a low of 82 and a high of 126 over the past two weeks. You can check here for daily updates showing which numbered groups appeared and faded away, along with a relative area for each. 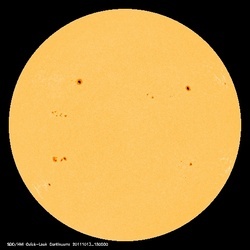 The latest forecast from USAF/NOAA has the solar flux at 135 on October 13-15, 130 on October 16-19, and 125 on October 20 through November 2. Predicted planetary A index is 5 on October 13-14, 8 on October 15-17, 5 on October 18-27 and 8 on October 28-30. Click here for a video of the Sun showing flares and other activity over several days, with audio from Thomas Ashcraft's receiver in New Mexico, where he records radio noise from our nearby star. Remember that the video and the audio are not synced in real time. Look for more information on the ARRL website on Friday, October 14. For more information concerning radio propagation, visit the ARRL Technical Information Service Propagation page. This week's "Tad Cookism" is brought to you by James Taylor's October Road.